Watch drone video of Operation Brother's Keeper arrests; nighttime raids met friction in Tulkarem. 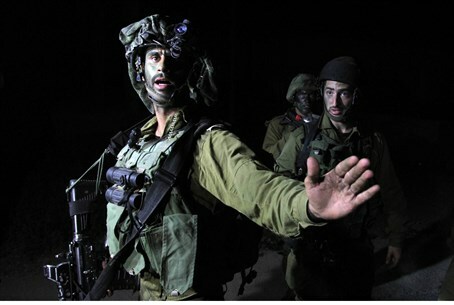 IDF forces continued their search for the three abducted teens in Operation Brother's Keeper on Tuesday night, arresting 17 more terrorists. Among the arrested was a member of the Palestinian Legislative Council (PLC) for the Hamas party, Khaled Tafesh, who was apprehended in Bethlehem, to the south of Jerusalem in Judea. Ibrahim is not the first PLC member to be arrested. Last Monday Aziz Duwaik, the Speaker of the PLC from the Hamas movement, was arrested. According to Palestine Liberation Organization (PLO) laws, Duwaik's position is second in line to that of Palestinian Authority (PA) Chairman Mahmoud Abbas. In addition to the arrests, there reportedly was Arab violence against the IDF forces during the nighttime operations at Tulkarem, just over the 1949 Armistice line to the east of Netanya in Samaria. The clashes ended with no injuries. Unique footage of the night's operations was released by the IDF Spokesperson Unit. The aerial video was film by a drone, part of the IDF drone unit that helped coordinate the arrests. In the film, the drone spots one of the wanted men leaving his home and entering a neighbor's home. Thanks to the drone's information, IDF forces are then seen entering the house to arrest the man. Later the forces return to the man's house to arrest another wanted suspect. Walla! reports that on Wednesday, the Nahal Paratrooper Brigade is to be replaced by the armored corps 401 Brigade in carrying out operations to the north-west of Hevron where searches have focused. The operation has so far seen the arrest of over 369 Hamas terrorists, 57 of them being re-captured after having been released in the 2011 Gilad Shalit deal that freed 1,027 terrorists. 65 Hamas institutions in Judea and Samaria have been closed, and over 1,800 houses have been searched. The arrests on Tuesday night come despite a Security Cabinet decision on Tuesday to scale down the IDF operations against Hamas and limit the mission to locating the teens, a decision that was initially denied by Defense Minister Moshe Ya'alon, who said Tuesday "there are no orders to reduce the level of activities in Judea and Samaria." Ya'alon stated, however, that "the activities against Hamas have for the most part been exhausted, but will be continued as long as needed - and it's not only an issue of the orders of the political eschelon." The apparent reason behind the Cabinet decision lies in concerns over the upcoming Islamic holiday month of Ramadan beginning Saturday, which has often been accompanied by Arab violence that could likely be ramped up with the operation. International criticism against the operation was also cited by the Cabinet. It is worth noting that the government has announced the three teens were abducted by Hamas terrorists in Judea and Samaria, with Prime Minister Binyamin Netanyahu remarking on Hamas's "war on Israel." For this reason the Hamas infrastructure was targeted in an attempt to break the terror organizations abilities to abduct Israelis and go after the source in locating the three teens.